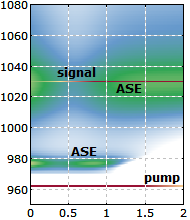 With the RP Fiber Power software, one can investigate various consequences of the Kerr effect, e.g. self-phase modulation or cross-phase modulation on ultrashort pulses or nonlinear self-focusing. with the nonlinear index n2 and the optical intensity I, which is proportional to the modulus squared of the electric field strength. The n2 value of a medium can be measured e.g. with the z-scan technique. Note that in addition to the Kerr effect (a purely electronic nonlinearity), electrostriction can significantly contribute to the value of the nonlinear index [3, 4]. The electric field of light causes density variations (acoustic waves) which themselves influence the refractive index via the photoelastic effect. That mechanism, however, occurs on a much longer time scale and is thus relevant only for relatively slow power modulations, but not for ultrashort pulses. Fused silica, as used e.g. for silica fibers, has a nonlinear index of ≈ 3 × 10−16 cm2/W. For soft glasses and particularly for semiconductors, it can be much higher, because it depends strongly on the bandgap energy. The nonlinearity is also often negative for photon energies above roughly 70% of the bandgap energy (self-defocusing nonlinearity). The time- and frequency-dependent refractive index change leads to self-phase modulation and Kerr lensing, for different overlapping light beams also to cross-phase modulation. Note that the effective refractive index increase caused by some intense beam for other beams is twice as large as that according to the equation shown above, assuming that both beams are in the same polarization state. The description of the Kerr effect via an intensity-dependent refractive index is actually based on a certain approximation, valid for light with a small optical bandwidth. For very short and broadband pulses, a deviation from this simple behavior can be observed, which is called self-steepening. It reduces the velocity with which the peak of the pulse propagates (i.e. it reduces the group velocity) and thus leads to an increasing slope of the trailing part of the pulse. This effect is relevant e.g. for supercontinuum generation. Furthermore, the strength of the Kerr effect is known to saturate at very high optical intensities. At extremely high optical intensities, there may not be a further increase of refractive index in proportion to the intensity, but a saturation and even substantial decrease of refractive index . 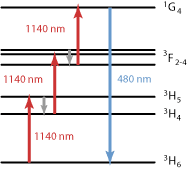 This can be understood as an effect of multiphoton ionization, leading to induced losses, which are related to additional phase changes via Kramers–Kronig relations [7, 8]. A nonlinear polarization with delayed (non-instantaneous) response cannot be simply described as a modification of the refractive index. Its effect is called Raman scattering, and is not considered to be part of the Kerr effect.